In my deepest seasons of suffering, I found that well meaning people said some really painful things. I knew they had good intentions, but their words were, at times, wounding. Of course, when you are suffering in pain, you are particularly sensitive and vulnerable to such things. One of the most often stated responses was, "I know just how you feel." It was a rare exception when this statement was made from someone who actually had been through the type of loss or grief that I was facing. So, it never quite sat well for someone to pretend to know how I feel when they were not and had not endured what I was enduring. This is what has come to mind as I try to process what is happening in our country in regards to the situation in Ferguson. Because I've reached the conclusion that white privilege is a very real thing. And as a woman in the majority race in our country, I cannot blithely say to anyone of a different color, "I know how you feel." Because I don't. I have not experienced what they have experienced. I have not personally been where they have been. I can attempt to empathize, but I cannot pretend to have a clue what it is to live in our country as a person of color. And I have decided that I won't spend too much effort or time attempting to process the facts of the Michael Brown case. While that may sound callous, the truth is that this case is merely a symptom. It's the presenting problem of a much deeper issue. And I personally think at the end of the day, what's happened in Ferguson (and now across the country in response) is really not as much about this specific boy and this specific police officer as it is a case example of the current status of race relations in America. I personally don't think it's productive to engage in some great debate about the officer and the angle of the gun and the boy and the details or witnesses. Because the conversation we need to be having is much bigger than that. Much broader. Listen, no matter what any grand jury or judge has to say, the truth is that the Michael Brown case has no winners. None. You have a grieving family of the deceased and a hurting family of the officer. And a community that is unraveling. Both families will forever be changed by this event. No one wins, at the end of the day. In my humble opinion. Everyone loses. And now, apparently, our country does, too. Because what happened in Ferguson says a lot about us as Americans. It says that while ground has been gained in regard to eradicating racism, there is much further to go. It says that there is still a great divide in America. It says that white people can try to say we know how you feel, but we don't. And it says that people of minority races live a different reality than we do and it brings a pain and frustration that we cannot begin to fathom because we have never experienced it. I was thinking yesterday that I wonder what Martin Luther King Junior would have to say or do in this moment in America? How could he lead this conversation and help to diffuse this situation? How would he respond? What wisdom could we glean? Oh, yes. He actually had a few things to say fifty years ago that I think are still quite relevant today. --Darkness cannot drive out darkness; only light can do that. Hate cannot drive out hate; only love can do that. --Love is the only force capable of transforming an enemy into a friend. --I refuse to accept the view that mankind is so tragically bound to the starless midnight of racism and war that the bright daybreak of peace and brotherhood can never become a reality...I believe that unarmed truth and unconditional love will have the final word. When it comes to this current situation, there is much I do not know. I have no real answers. But, I have firmly landed on a few things that I want to express today. Besides the fact that we, white people, cannot casually tell those who are hurting that we know how they feel. Because we don't. We live a different reality because of the color of our skin and we cannot pretend in a condescending voice to "get" their reality. I also know that as I considered what MLK would have to say and researched some of his quotes yesterday, he landed firmly on one idea. And that is love. He, being a follower of Jesus Christ, chose love. He chose to walk in love and act out of love and speak out of love. Because that is what our Savior did on this earth and on that cross. In every situation, in every controversy, in every interaction, Jesus chose love. And we, being followers of Christ, must do the same. As I scrolled through the Facebook feed yesterday, I kept hiding people's post. And please, hear me, as I am trying to speak from a place of encouragement and love. I ain't yelling at you. But, being divisive clouds our call to act in love. Warning is not my style here on this blog because I am a person who hates conflict. But I will say that I chose to hide divisive posts yesterday...on both sides of the issue...and I guess that was my way of having nothing to do with the division. 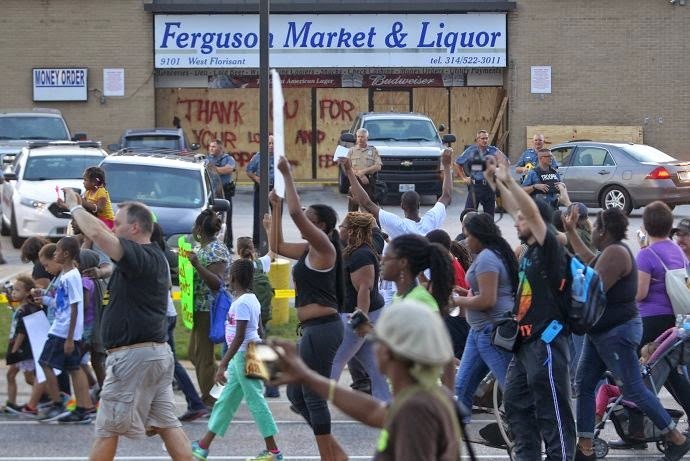 What Ferguson shows us is that there remains a division in our country. There remains dividing lines. We have yet to achieve "equal concern for each other." This was what I told my daughter as I tucked her in last night and she burst into tears about this situation. She hates conflict too. She felt scared from the brief glimpse of the protesting she caught on television. I told her that it's a tale as old as time. Division. Racism. Hatred because of nationality or religion. It happened between the Israelites and the Egyptians. Between the Jews and the Gentiles. Between the majority race and the minority race, all around the world. I reminded her that we live in a broken, broken world with hurting and broken people. I reminded her of the Martin Luther King Junior speech, "I Have a Dream"--which we make our kids watch every MLK day. I reminded her that in some ways, this dream has been realized. Because she does not live in a world with segregated schools or separate water fountains. That can be celebrated. But the divide remains. There is still so far to go. And while I hate to be defeating, I don't believe that the division will be erased completely until Jesus returns to earth and brings a new heaven and a new earth. But, in the interim, we -- we have the power to choose. We can choose to add to the divide, to fuel the divide. Or we can choose as Jesus did. We can choose love. We can choose to be a cooler head that prevails and to stop and listen. To attempt to understand, acknowledging firmly that we don't currently. We can come to the table with open hearts and open ears and open minds and see the people, not the situation. Because behind all this madness, there are hurting people. Aside from the firm facts that I don't know how it feels to be black or Hispanic or Middle Eastern in modern day America, I know that Jesus calls us to love and to be mindful of avoiding divisiveness. And I know one other thing. Violence begats violence. Anger begats anger. No matter how deeply you are wounded, choosing to react in a violent manner accomplishes nothing. Looting does not accomplish progress. Screaming does not lead to being heard. Instead, the end goal must be firmly kept in mind so that the actions can move toward that. If the goal is closing the gap between the reality of white privilege and the reality of being a minority in America, then we need to put down our signs and quit pointing fingers and listen to each other. We need to see past the circumstance to the deeper needs and issues. We need to respond in love and not react in anger. At the end of the day, there is far more that I don't know than that which I do. Yet, I still felt prompted to share my thoughts today. I'm just a white girl living in the suburbs and raising my kids and enjoying things in my life that I don't even realize are privileges because this is my only reality. But I want you to know that I see you. I see the pain and the wounds and the hurt and the confusion over things that I have never endured. I see that the minority populations in our country are in a season of suffering. And the only thing I have to offer is to say I have no idea how you feel. But, I'm listening. And I choose love. Not division.